" 1. thinking through how space becomes: the space is performed through spatial practices - by sneaking in, climbing a fence, clambering down a drain, the search for good vantage points and the composition of photographs 2. the nature of territoriality: thinking about how cities are produced as ‘property’ (spatial fixity) and imagining an urban ‘right-to-roam’ (spatial mobility)? 3. ‘spatial hauntings’: the experience of place as opposed to written histories/testimonies, as a way complementing other representations, experiencing and then capturing in photographs the layers of memories in a place (memorialisation) 4. ‘cities without people’: perhaps a way of thinking post-human urbanity? what happens to space when people stop caring in the normative sense; when entropy runs unchecked 5. ‘exploration’ as method: can expeditionary practices open up ways of knowing that capture (at least partially) the fragmentary nature of places, the unknowing permeating through city, that other methods fail to capture; research becoming risky, finding things out becomes fun. 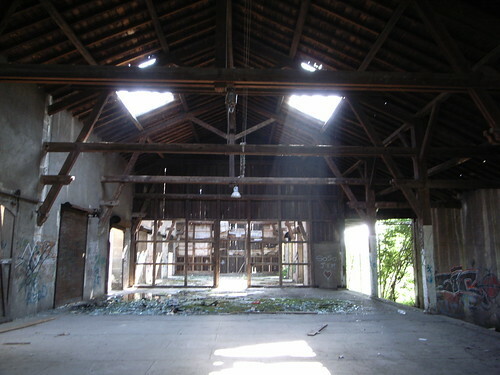 UE as ‘post-method’ method, working without permission, without risk assessments, without ethical approval "
Why do I blog this Urban exploration, place hacking is a fascinating practice (tightly related to psychogeography to some extent). The conclusion is very insightful, Dodge claims that "urban exploration provide an interesting set of spatial practices through which to explore a range of geographic issues such as production of space, territoriality and property, memory and place, geographic knowledge". The picture has been taken France few weeks ago when exploring some abandoned train station.